Mobileauthorize™ for Android is your complete mobile processing solution for accepting credit card payments both in and out of the office. Swap meets, street fairs, antique shows, mobile detailing, on-site consultants, taxi cab drivers, tour guides.. the list is endless on who could benefit by offering the convenience of accepting credit cards on the spot and the peace of mind getting immediate authorization for the charges. Planetauthorize offers impressive, revolutionary, yet functional credit card charging capabilities for the merchant. It combines the convenience and mobility of the Google Android with the power to do business, make sales, and authorize/capture charges anywhere there is a network connection. Planetauthorize provides merchants with the ability to accept Mobile, Internet and Retail payments using a single payment platform. Mobileauthorize integrates with the Planetauthorize.Net payment gateway so all customer payments are available in one location. Accept Credit Cards and Electronic Checks from your Mobile Phone, Tablet or Computer/Laptop. Planetauthorize solutions will process keyed or swiped transactions using cutting edge hardware encrypted card readers, geo-tag locations on the receipt where the transaction occurs, e-mail receipts, capture digital signatures,and perform partial or full refunds within the transaction history log. The application is free to download and incurs no additional per transaction fees. 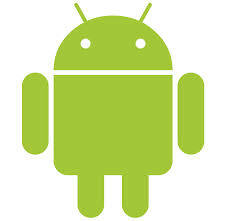 Our Android mobile application can process credit card payments in your local currency. Mobileauthorize supports 85 Currencies so your customers can pay in the currency they know. Accept all major credit cards online and on the go using Mobileauthorize. Our Mobileauthorize application integrates with the Planetauthorize.Net payment gateway and is available in the Google Play Store. Download Planetauthorize for Android devices . Merchants can also download our free mobile application with encrypted card swipe from the Planetauthorize payment gateway. Accept Credit Card Payments. No Payment Gateway Required. Online account management included. Requires Capital Bankcard Merchant Account from our office. Price: $7.95 per month. Authorize and Capture Charges Immediately verify the credit card is valid, has sufficient funds, and then mark for payment at the next available settlement cycle performed on the gateway. Authorize and Reserve Funds With this option, you can verify funds are available and place a hold on the funds until the contract is complete. This could apply to contractors, handymen, rental agencies, or any merchant that wants to assure funds are available before work is started. The funds are held for 30 days or until the time the merchant captures or voids the transaction, whatever comes first. With every successful transaction, an email of the transaction can be automatically sent to the customer. Additional data can be captured with every transaction, giving the option for a more detailed receipt to be emailed to the customer, and also providing additional essential data for later import into Quickbooks, if desired. PlanetAuthorize features a detailed transaction log of all successful transactions. Not only is this a valuable reference log of past activity, but also serves as the gateway for processing Voids, Credits, and Captures. Voids can be performed for transactions that have been requested submitted for payment if the gateway hasn't settled the amount yet. Voids can also be performed on transaction that required a hold of funds to release the funds back to the customer. After funds have been put on hold, PlanetAuthorize make it very simple to request those funds be transferred from hold to your account for settlement. For transactions that have been settled and cannot be voided, you have the options of processing credit/refunds right from the transaction log. You are not required to credit/refund the full amount of the initial transaction. All that is needed to process a credit/refund is the last four digits of the original credit card. Allow your customers to select from a gratuity screen the amount of tip they would like to include, if any. 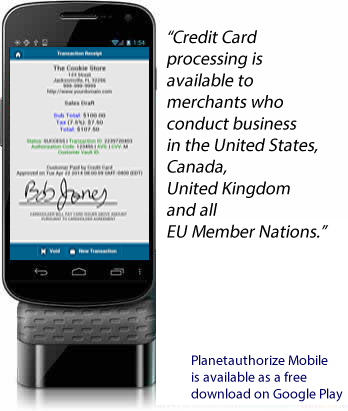 To get started with the Planetauthorize Payment Gateway service and our free Android application Contact Us or	call SaleManager, toll free, at 1-800-918-4890. For more information regarding SaleManager mobile apps visit mobileauthorize.com.